I take great effort to find quality stones, jewelry, essential oils, lamps, tarot and oracle cards, bags, etc. at affordable prices and then pass those prices on to my customers/clients. I also offer biomat treatments and counseling services by appointment. I offer classes on various topics such as wire wrapping, tree of life pendant classes, dream-catchers, etc. In addition, I take special orders and will look for items that people want and then get them in for them. That way they don’t have to do the searching and comparing and trying to find the best price. Ask about my custom artwork for sale! 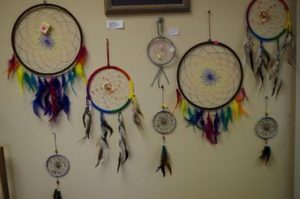 That is everything from drawings to paintings, to carvings, to dream catchers, wire wrapped jewelry, glass beads, etc. URGENT- Please help me cover the recent moving and related expenses including new signage for the new location. Click here to help out!